There is a worldwide search of methods for initiating the process of producing laser light in free-electron lasers (FEL) with a well-defined radiation pulse, generated by an external laser source and superimposed to the electron bunch at the undulator entrance ("seeding"). Seeding promises an FEL pulse which is more stable and better reproducible in both pulse duration and frequency spectrum. Moreover, the obtained time resolution of pump-probe experiments is improved when the seeding laser simultaneously initiates a dynamic process in the investigated sample. 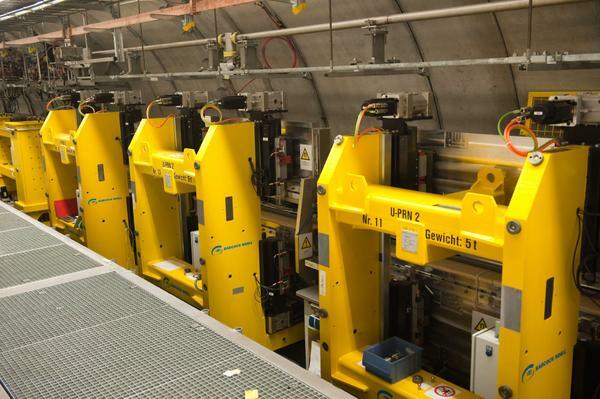 The sFLASH undulators in the FLASH accelerator tunnel. One of the possible seeding methods using the so-called HHG (High Harmonic Generation) pulse was now successfully verified at FLASH by a team of scientists from DESY and the University of Hamburg during the night shift of 28 to 29 April. In the sFLASH experiment, the scientists coupled the light of the high-order harmonic with an accelerator-synchronised laser into the electron beam of FLASH and superimposed it with the electron bunches in an undulator line. Here, the electron bunches, incited by the seeding pulse, generated an intense FEL flash with a wavelength of 38 nanometres. This is the shortest wavelength ever obtained with this “direct seeding” method – a new world record for FLASH and also an important milestone on the way to FLASH II, which will be equipped with variable-gap undulators used at the sFLASH experiment, and with a seeding option.